After your team members have entered their task status into Project Web App, you can accept their updates and then see changes to the schedule in Project. Click File > Info > Check Progress. 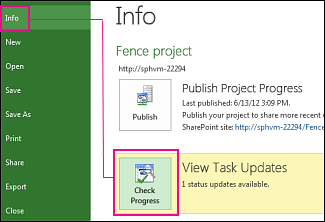 In the example below, one task update is ready to be added to the schedule. In Project, click File > Info >Check Progress. Project Web App will open. 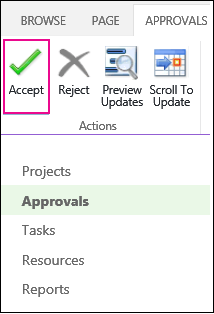 On the Approvals page in Project Web App, select the task status reports, and click Accept so that changes to tasks can be added to the schedule opened in Project. Tip: After updates are added to Project, you can track the progress of your schedule.